The FIA, Formula 1's governing body, has recently released information detailing Christian Horner's role in an alleged scandal that saw the Red Bull RB7, RB8, and RB9 chassis fitted with various illegal traction control systems. In addition, several members of the FIA's testing body have also stepped down today; these members are charged with accepting bribes from the Red Bull team principle. Aiming not to lose pace on the other 2014 cars, Helmut Marko has appointed Mark Webber to replace Christian Horner's duties at Red Bull until they find another suitable team principle for his replacement. Mark Webber is highly qualified candidate to run this team, knowing the ins-and-outs of Formula 1 and Infiniti Red Bull Racing's place in the sport. He will run the team to the best of his, or anyone else's, abilities on this short of a notice. 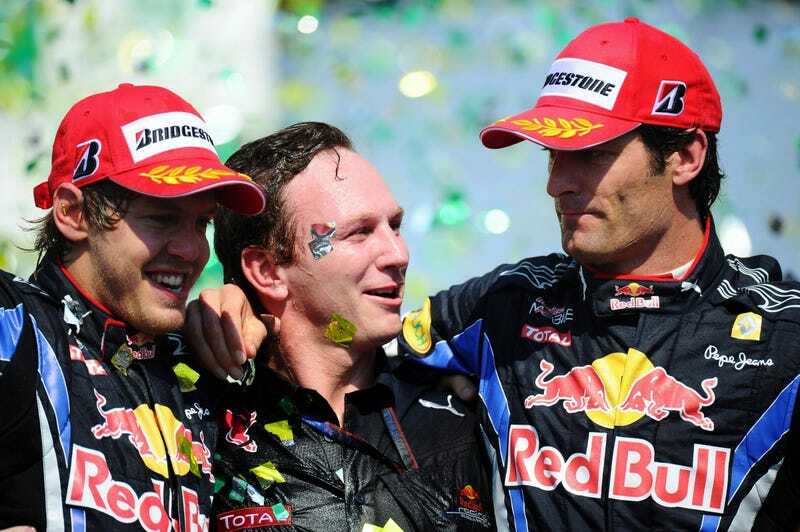 Christian Horner's actions do not reflect the views of Infiniti Red Bull Racing and its partners, and these cheating allegations are most unfortunate and were of no knowledge to either me or Mark Webber prior to the FIA's release. Amidst reports that the traction control system was fitted sometimes to only one of the two Red Bull chassis, speculation of Sebastian Vettel's role increases. The four time world champion could not be reached for comment at this time.